California Gov. Jerry Brown has proposed a $155 billion state-spending plan for fiscal year 2014-15, which includes billions to pay down debts. Unfortunately, Brown’s debt proposal doesn’t go nearly far enough. In 2011, the Wall of Debt’s level of outstanding budgetary borrowing totaled $34.7 billion.... The debt has already been reduced to less than $25 billion. The [proposed] budget reduces this debt by more than $11 billion this year, and fully eliminates it by 2017-18. The so-called “Wall of Debt” includes: deferred payments to schools and community colleges; Economic Recovery Bonds; loans from special funds; unpaid costs to local governments, schools, and community colleges for state mandates; underfunding of Proposition 98; borrowing from local governments (Proposition 1A); deferred Medi-Cal costs; deferral of state payroll costs from June to July; deferred payments to CalPERS; and borrowing from transportation funds (Proposition 42). These payments of $11 billion are for all the accounting gimmicks and raiding of funds politicians used in years past to create the illusion of a balanced state budget. So the wall stands decidedly on the high side. 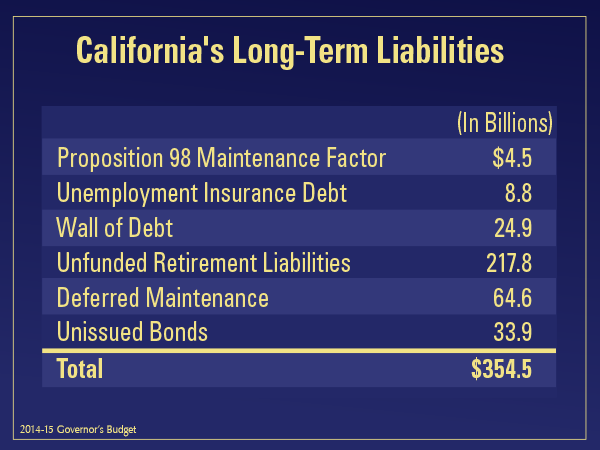 By paying down the Wall of Debt, Brown said, “no longer will billions each year be needed to pay for the expenses of the past.” But according to Brown’s own Department of Finance, the Wall of Debt is miniscule compared to the mountain of total debt California state government has accumulated (see graphic below). This estimate of $354 billion, or $9,200 per California resident, is likely on the low side, too. The overwhelming majority of the state’s long-term liabilities are for pension and healthcare benefits for government workers after retirement. According to the Department of Finance’s estimate, the state should have $217 billion more in the bank to safely pay for the pension and healthcare promises already made to active and retired public employees. And this amount is likely too low because California’s pension funds have used unsound methods to calculate their unfunded liabilities. The total amount will also rise by billions if more bonds are needed to complete the high-speed rail project. The official cost estimate for the “bullet train” is $68 billion, but some say it will eventually cost at least $100 billion. Brown is a strong backer of the train, but as a former Jesuit seminarian he should recognize that burdening California’s children and grandchildren with mountains of debt is immoral. It is immoral to force future Californians to pay hundreds of billions of dollars for services they never received or debt they never consented to. Brown is better positioned than past governors to recognize the immorality of California’s debt burden, and hopefully he’ll work to stop debt from growing and reduce its future impact. Scrapping the bullet train and making meaningful changes to California’s public pensions would be giant first steps.